Here at Green’s, we are renowned for our wide variety of tasty cake mixes for everybody to enjoy. Try our sponge cake mix, the amazing product created over 100 years ago, by Horace Green, when the Green’s story began. We also have our cartoon cake range. So you can enjoy fun baking with the kids with our Thomas Best Friends or Shaun the Sheep cake kit. 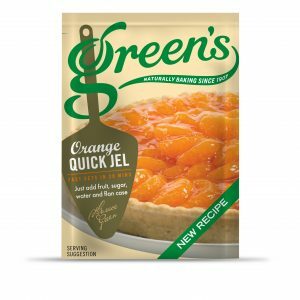 Let Green’s help you take the time out of your home baking. Enjoy quick yet delicious cakes in no time! We guarantee baking perfection each time. Anybody can enjoy the exhilarating feeling of achieving amazing home baking. If you have a passion for baking but time is of the essence, or if you are just starting your baking endeavours, then our cake mixes are perfect for you. Alternatively, enjoy fun with the family and kids, with our easy to make cake mix. Put a zing into your fundraising with our<strong> </strong>Cake Mix. Get ready to whip up a moist, light vanilla cake, simply add eggs, oil and water to create a fabulously light and cake decorated with sweet lemon frosting and topped with edible Pudsey wafers.Impress your office colleagues with this unbeatable cake mix and collect donations with every slice! A minimum of 70% from the price of this carton will benefit BBC Children in Need.BBC, BBC Children in Need and Pudsey Bear are registered trademarks of the BBC and are used under licence.BBC 2007 Reg. charity England & Wales no. 802052 and Scotland no. SC039557. Mix up a batch of these delicious zesty refreshing Pudsey Cupcakes. The mix creates light and fluffy vanilla cupcakes that you and your family and friends will adore. Top them off with the lemon icing and add the edible Pudsey wafer.These are great to add to your bake sale!Get some today and collect donations with every cupcake. A minimum of 70% from the price of this carton will benefit BBC Children in Need.BBC, BBC Children in Need and Pudsey Bear are registered trademarks of the BBC and are used under licence.BBC 2007 Reg. charity England & Wales no. 802052 and Scotland no. SC039557. The perfect box to start your own BBC Children in Need fundraising bake sale, so you can mix it up, whether your planning on fundraising from your office, school or local club.Contains:1 x <a href="https://www.greenscakes.co.uk/product/bbc-children-in-need-cookie/">BBC Children in Need Cookie Mix</a>1 x <a href="https://www.greenscakes.co.uk/product/bbc-children-in-need-cake-mix/">BBC Children in Need Cake Mix </a>1 x <a href="https://www.greenscakes.co.uk/product/bbc-children-in-need-cupcake/">BBC Children in Need Cupcake Mix</a>We have everything you need to get started. A minimum of 70% from the price of this carton will benefit BBC Children in Need.BBC, BBC Children in Need and Pudsey Bear are registered trademarks of the BBC and are used under licence.BBC 2007 Reg. charity England & Wales no. 802052 and Scotland no. SC039557. Green's Chocolate Cake Mix is a must-have for your everyday and special occasion baking.You can make 2x9” cakes, a 2 lb loaf cake, 36 cupcakes or 18 muffins!Simply add eggs, oil and water to create a super moist cake.Why not make your own chocolate frosting to compliment your cake by mixing together 150g of icing sugar, 1 tablespoon of cocoa powder, 10 ml water and 75g softened butter. Our new Chocolate Egg Cake Kit is fun and easy to bake and is sure to satisfy cake and chocolate lovers alike. All you need to do is add two medium size eggs to create the cake, and then mix 125g of butter and water to the frosting mix to create a smooth and chocolatey finish. The coated chocolate eggs can then be used to decorate the cake, or you can let your imagination run wild!Our Chocolate Egg Cake Kit offers both experienced and would-be bakers all the tools required to make a range of delicious Easter treats in a matter of minutes. From mouth-watering cupcakes, muffins or a loaf cake, the Chocolate Egg Cake Kit can be used to create them all. Bake the fluffiest, lightest classic sponge with our simple to use chocolate sponge cake mix. With Green’s and a sense of fun you can create a range of irresistible recipes Coffee & Walnut. Green's Coffee Cake Mix is a must-have for your everyday and special occasion baking.You can make 2x9” cakes, a 2 lb loaf cake, 36 cupcakes or 18 muffins!Simply add eggs, oil and water to create a super moist cake.Why not make your own coffee frosting to compliment your cake by mixing together 150g icing sugar, 1 teaspoon of coffee dissolved in 1 tablespoon of hot water and 75g softened butter. Green's Orange Cake Mix is a must-have for your everyday and special occasion baking.You can make 2x9” cakes, a 2 lb loaf cake, 36 cupcakes or 18 muffins!Simply add eggs, oil and water to create a super moist cake.Why not make your own orange frosting to compliment your cake by mixing together 150g of icing sugar, the zest and 10ml of juice from an orange and 75g softened butter. Green's Vanilla Cake Mix is a must-have for your everyday and special occasion baking.You can make 2x9” cakes, a 2 lb loaf cake, 36 cupcakes or 18 muffins!Simply add eggs, oil and water to create a super moist cake.Why not make your own buttercream frosting to compliment your cake by mixing together 150g of icing sugar, 10 ml water and 75g softened butter.